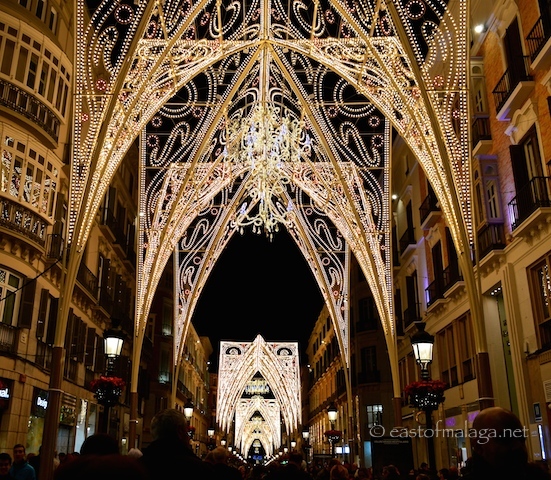 During the festive season, the Christmas Lights in Málaga are always a great place to visit, but this year they have really surpassed themselves. They are nothing short of spectacular! 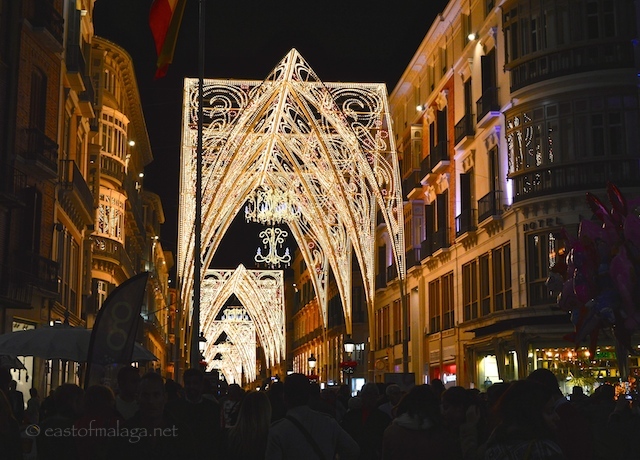 Each evening, Calle Marqués de Larios, the main pedestrianised shopping street is crowded with people enjoying a party atmosphere with balloons and street performers to entertain them. What I particularly love here in the city, as in every village and town across Spain, you will see all the family generations out taking their evening stroll together. Whilst they are still open, the shops, as well as the bars and restaurants are brimming over with people either doing their Christmas shopping or just soaking up the festive atmosphere. 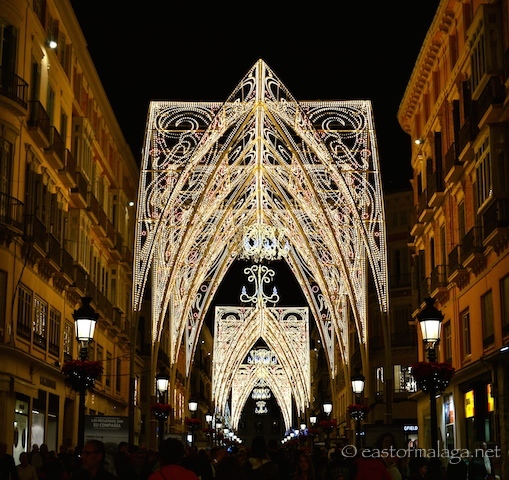 The stars of this particular light show are shining brightly on Calle Marqués de Larios (famous for being paved with marble), and this year’s display has a Gothic feel, with a cathedral-arched frame dominating the street. Most surrounding streets have a more modest display of lights too, so have a wander around and see them, but don’t forget to look up at the beautiful buildings, too. 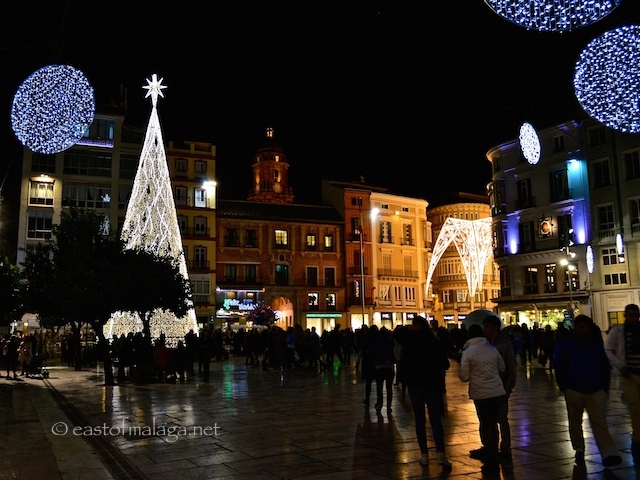 You’ll see bright red poinsettias everywhere – planted on the roundabouts, hanging from lamp posts and displayed in huge cones around Calle Larios. There’s a huge choice of bars and restaurants to tempt you – many with their gas-flame heaters burning outside to keep you warm. If you have to drive back home again later, you might prefer to try the best chocolate and churros in Málaga, at Cafe Aranda in Calle Santos. The light, crispy churros and thick, creamy hot chocolate to dip them in are absolutely scrumptious! 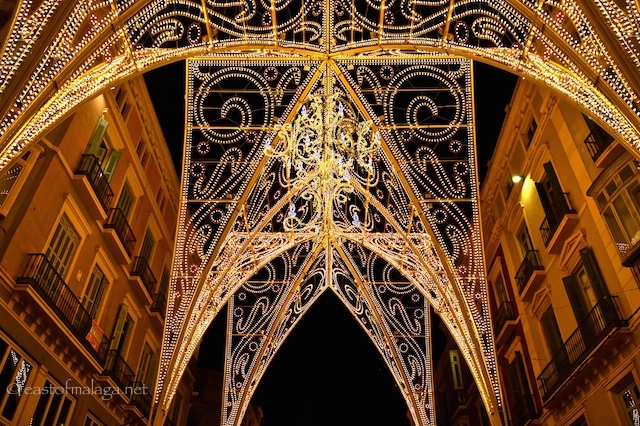 Afterwards, wander down Calle Larios to the main road through the centre, Alameda Principal, to see the beautifully lit trees and the flower stalls or turn left and walk along the edge of the Paseo del Parque to enjoy the many Christmas stalls lining the route. Marvel at the huge Christmas tree in Plaza Constitución, with the Gothic arches peeping at you from Calle Marqués de Larios, inviting you to come closer. It’s easy to be fooled by the blue skies and warm sunshine, but yes, it’s only two weeks until Christmas Day. 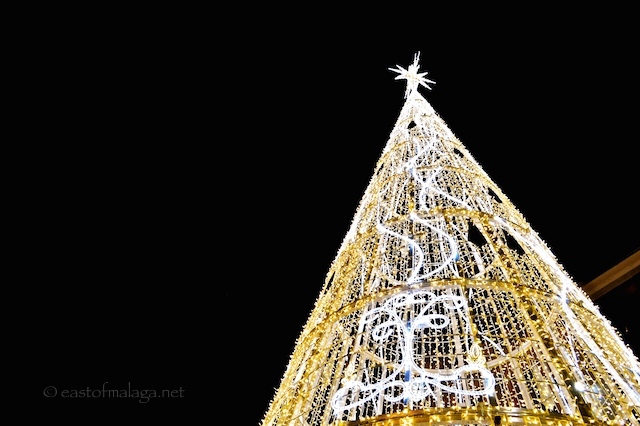 You can really get in the mood for Christmas by visiting the outdoor skating rink in front of El Corte Ingles, or go to see one of the many the Bélens (crib and Nativity scenes) around the city – of which the best (in my opinion) is in the Town Hall. What’s YOUR favourite thing to do or visit at Christmas?